VCOG will hold its annual conference December 8 at Montpelier, the home of James Madison, who is often credited with being the Founding Father of open government. Stay tuned for details. VCOG will hold its first FOIA training webinar, sponsored by Tidewater Community College, on Oct. 4. Details will be on VCOG’s website and daily newsletter next week. The National FOI Coalition will hold its annual conference in Washington, D.C., Oct. 7-8. VCOG’s Megan Rhyne is the secretary for the NFOIC Board of Directors and will be on a panel discussing how open government coalitions like VCOG can advocate for and against attempts to amend open records and open meetings laws. Click here for more details and registration. 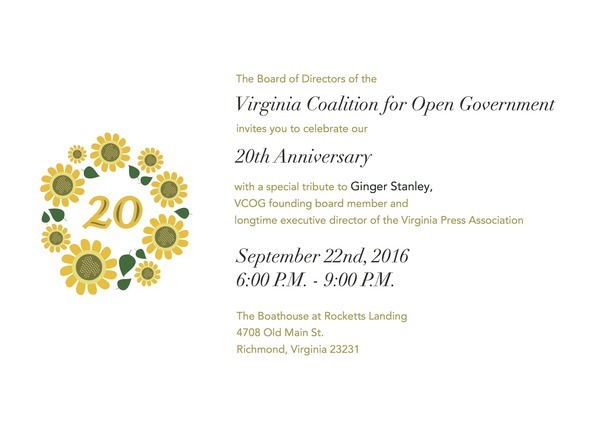 In just three weeks, VCOG will be celebrating its 20th anniversary at Rocketts Landing in Richmond. Tickets are still available, as are donations, tables and sponsorships. RSVPs should be in by the 13th. Click here to get started! VCOG joined the D.C. Open Government Coalition and the D.C.-Maryland-Delaware Press Association in signing a letter to Virginia, D.C. and Maryland government leaders urging them to include specific transparency measures when authorizing a tri-jurisdiction oversight committee for the Metro system. This fall, the D.C. City Council will consider the Metrorail Safety Commission within the Washington Metropolitan Area Transit Authority. The initial proposal vaguely suggests transparency measures, but we argued specific standards must be affixed to an agency with the power to spend tax money and make decisions that could affect millions of commuters and residents. Maryland and Virginia are expected to entertain similar measures during the 2017 legislative session of each. The family of an inmate at the Department of Corrections Sussex II State Prison has filed a federal lawsuit against the DOC that includes an evidentiary issue about the destruction of prison surveillance videos. Inmate James Raynor claims a corrections officer allowed another inmate to destroy his property and repeatedly punch him. Video with audio of the incident was unavailable. In a hearing before a magistrate judge, an attorney from the Attorney General’s office representing the DOC said the destruction was inadvertent. Raynor’s attorneys pointed out that the DOC’s director signed a records retention schedule promulgated by the Library of Virginia’s records management office that sets out how long surveillance videos should be kept before being destroyed: 30 days under normal circumstances; five years if it documents actual or threatened events outside the ordinary routine. The AG’s attorney contended that the library’s policy was not the DOC’s policy and that any destruction of the recordings at issue were inadvertently destroyed. Sign up for VCOG's daily listserv on access and First Amendment news from Virginia and accross the country. It's free! 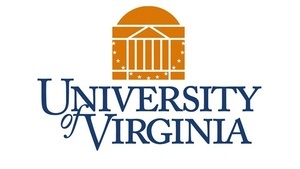 Bill Goodwin, the rector of the University of Virginia’s Board of Virginia had skeptical words for the FOIA Council at a hearing examining the university’s so-called Strategic Investment Fund. In response to a fact pattern presented by Kevin Martingayle, attorney for former BOV rector Helen Dragas, the FOIA Council issued an opinion saying that as described, the motions to go into closed session to discuss the fund, as well as the discussion itself, did not comport with FOIA’s standards. The council’s executive director, Maria Everett, clarified that the council’s opinions are advisory only and that the council is not an investigative agency. Opinions are written in hypothetical language. “We have to assume the facts are what you say they are,” she said. Since it went live in 2000, the council has issued hundreds of opinions, many favoring government positions, and many favoring public access. The council has also answered thousands of questions via email and telephone. People representing over 30 state and local government agencies, newspapers and advocacy groups attended a work session to discuss revising the personnel records exemption in FOIA. Comments centered on whether and how the term should be defined, with most in the room agreeing that the goal is to distinguish between records detailing the employee-employer relationship (like things a person’s supervisor or the human resources department would take care of) and those records representing the actual work the employee performs for the entity (like preparing reports, entering data, etc.). The group also largely agreed that an exemption for certain administrative investigations be brought into line with the personnel exemption. The devil, of course, is in the details. Suggested wording is being sought in advance of the workgroup’s next meeting. A workgroup studying the trade secrets and proprietary records exemptions could not reach consensus on a single exemption to take the place of two dozen individual exemptions. The meetings subcommittee has been considering FOIA’s policy and some procedures, but because the subcommittee has been short two members (two previous members stepped down when their terms expired from term limits on July 1), it has not taken any action. Some citizens in Petersburg complained that the city was holding frequent special meetings with little notice to the public, scheduling them during work hours when citizens cannot attend and holding them in small venues. According to the Richmond Times-Dispatch, the city held 13 special meetings from February through July, often with just 24-hour notice. The Front Royal police department and its town council were in disagreement over whether the town should remove surveillance cameras from the downtown area. Once councilman said he saw the cameras as an invasion of privacy since camera footage can be obtained through a Freedom of Information Act request. Hampton Roads Regional Jail officials reversed their original claim that security video recorded outside a mentally ill inmate’s cell was deleted after he died last year. The video was found after jail officials told a Richmond Times-Dispatch reporter in April it had been recorded over. The Hampton City Council decided to try moving public comment period from the end of council meetings to the middle of them. In January the council with reevaluate if the change in comment time is more helpful in getting young people or seniors involved in city business. Former Norfolk council member Andy Protogyrou dropped his lawsuit against Sheriff Bob McCabe — both unsuccessful candidates for Norfolk mayor — over Protogyrou’s claim that McCabe wrongly withheld requested documents, including records of McCabe’s work calendar and a full accounting of a program that lets people buy hot meals for loved ones in jail. Governor Terry McAuliffe’s office released a partial list of the 206,000 felons whose rights the governor attempted to restore through executive action before the Virginia Supreme Court struck the action down. The list, available through the Department of Elections website, had 12,832 names on it, all of whom registered to vote after McAuliffe’s order but before the court’s ruling. Meanwhile, Loudoun County Commonwealth's Attorney James Plowman has filed suit against Gov. Terry McAuliffe over access to the records of the 206,000 felons whose rights would have been restored by the governor's order. The case is still pending. The Prince William County’s geographic information system department launched an app in August designed to give the public real-time information about road closures in the county. A federal district court awarded the Virginian-Pilot $100,000 in attorney’s fees for its suit against the FBI to disclose records concerning its investigation of the deaths of several agents in an accident. The agency initially disclosed 29 pages, but after the Pilot filed suit the agency located 889 responsive pages, of which the agency disclosed 10 pages in full and 83 pages in part. The $100,000 award is actually less than what the Pilot asked for but the judge said the paper was not entitled to fees for time spent on administrative proceedings before it filed suit. The City of Norfolk made a slight policy shift in the way it handles footage recorded on body-worn cameras in police shootings. The city agreed to show video footage of the shooting of Willie James to James’ family, the Norfolk NAACP and reporters from the Virginian-Pilot. The video, slowed down frame by frame, clearly showed James had a knife in his hand when he was shot. Mayor Kenny Anderson said the city should show video to family members when it acted properly. The video will not be released to the general public, though, because of the city’s concern that the public won’t understand the video without proper context. In preparing a story on bonuses paid to government employees in Hampton Roads, Virginia Beach turned over records of all employees who received bonuses from January 2011 to October 2015 along with explanations of why some of those bonuses were awarded. Norfolk initially refused to give names of employees who received bonuses in a similar time frame but eventually relented after the Pilot enlisted an attorney.